2. 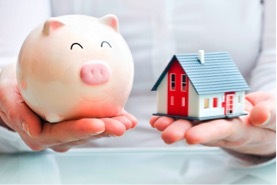 Start a reserve fund: A household savings account should be a priority for new homeowners. Putting away a few dollars every month for unforeseen maintenance costs will not only give you peace of mind, but it can also prevent you from going into debt when it comes time to replace your furnace, install a new roof or replace your windows. 3. Be a savvy shopper: Before you move into your new home, you will need to set up your electricity, home insurance, home security, gas, phone, TV and Internet services. While there may not be more than one or two options in electric and gas companies, you can shop around for a better rate for insurance, TV, internet, home security and phone services. Call a few places and ask about special 'bundling' rates for both telecommunication services and insurance. 4. Connect with your inner-DIY'er: A fantastic gift for any new homeowner is a complete toolkit. Knowing how to repair and maintain simple aspects of your household systems will save you the cost of hiring a professional. You can find step-by-step instructional videos online for everything from installing a ceiling fan to repairing a hole in the drywall. Just be sure to turn to an expert for any major issues, like electrical and plumbing.